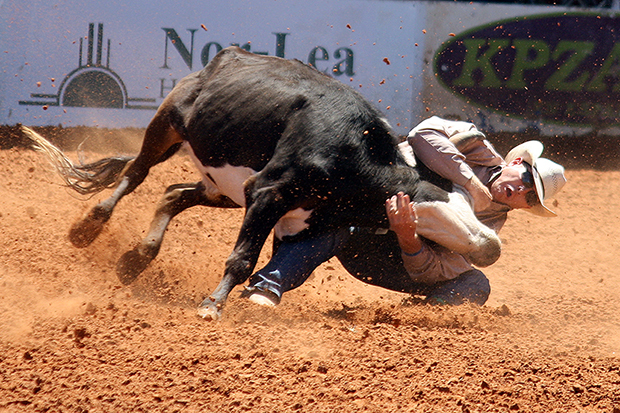 Hunter Cure, the 2013 world champion steer wrestler, grapples his animal to the ground during last year’s Lea County Fair and Rodeo. He is one of numerous world champions who will be part of the Lovington rodeo next week. LOVINGTON, N.M. – There is a certain passion that follows the rodeo trail. It takes a lot of love to compete in a sport best known for a gypsy lifestyle, where the road not only is a way of transportation but also a place to live. When full-time cowboys and cowgirls leave their homes in June, they know there is a great chance they won’t return until September. They sleep in vans, motels and specialized horse trailers that are outfitted with elaborate living quarters, and they make a living eight seconds at a time. They dream of big-money opportunities, and they’ll get it at the Lea County Fair & Rodeo, set for 7:30 p.m. Wednesday, Aug. 6-Saturday, Aug. 9, at Jake McClure Arena. For four nights, the sport’s brightest stars will make their gypsy homes in Lovington, even if only for a night, in order to compete at one of the largest events in ProRodeo. “There are several reasons we get so many of the top contestants,” said Corey Helton, chairman of the Lea County Fair Board. “I think we’re competitive with the added money, and the purse is similar to other tour rodeos going on at the same time. Carr owns Pete Carr Pro Rodeo, which will produce the rodeo and the Lea County Xtreme Bulls, which takes place at 7:30 p.m. Tuesday, Aug. 5. Carr has been a fixture in Lovington for a number of years. The Carr crew packs quite a punch when it arrives in southeastern New Mexico. Last December, there were 27 Carr animals that were selected to perform at the Wrangler National Finals Rodeo, a Professional Rodeo Cowboys Association record. In addition, Carr was nominated as the 2013 stock contractor of the year. Good livestock is critical to a good rodeo, and regular NFR qualifiers know they’ll have a shot at a good paycheck when they arrive in Lovington to compete. Good money and great stock are just two of the many ingredients that go into making Lea County a rodeo hot spot every August. “I think there’s a lot of history around here with the Cooper family and Guy Allen and all those that have ties to the county,” Helton said. “Those families live here, and that helps bring the cowboys here. But there’s also the cowboy atmosphere that’s here. You can’t say enough about that. That has translated well. Last year, the Lea County Fair and Rodeo was nominated as the PRCA large outdoor rodeo of the year, which is proof the cowboys love what is done in Lovington each summer.